Pro Dive is Cairns' premier Dive School and Outer Reef liveaboard dive operator. Since 1983 we have developed an international reputation for quality, professionalism, safety and value. We are locally owned and operated by Quicksilver Connections. We specialise in 3 areas, dive courses, 3 day 2 night live a board dive trips for certified divers and retail sales of dive, snorkel and water sports equipment. Our goal is to provide the very best quality and standards in everything we do. When it comes to diving on the Great Barrier Reef Pro Dive Cairns should be your first choice. Our 3 premium, custom built, multi million dollar liveaboard dive vessels provide the ideal way to really experience the Great Barrier Reef. These vessels are the only outer reef liveaboard dive boats in the area that are purpose built for what they do. Each vessel carries a maximum of only 32 passengers and all accommodation on board is twin share. For clients undertaking dive training Pro Dive Cairns is the premium dive school in Cairns. We are a PADI 5 Star Training and Instructor Development centre. This means that you'll get the highest standards of dive education available. Our modern, purpose built, dive centre provides the best diver training facilities available with 3 air-conditioned classrooms and a large, 4 metre deep, heated training pool. Our experienced instructors are carefully selected for their personality, customer service ability and passion for diving, teaching and the Great Barrier Reef. The Pro Dive Cairns retail centre is situated in the heart of Cairns and offers the largest range of dive and watersport product available. We also provide the highest service standards available in the area. Our dedicated and knowledgeable retail staff can advise on the best products to suit your specific requirements. 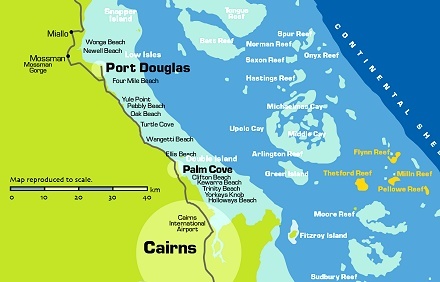 Our 16 exclusive dive sites are situated on some of the best Outer Great Barrier Reef locations. These sites are chosen for their spectacular coral formations, varied marine life and consistent visibility. On every trip we visit a variety of these spectacular, uncrowded and unspoilt locations ensuring a memorable experience for all our customers. Pro Dive Cairns has a staff of more than 60 committed diving professionals. Many of these people have been with us for a number of years with some with more than 15 years of dedicated service to the company. Our staff are an integral part of what we do and have helped us build our reputation as an industry leader. We look forward to taking you diving on the Great Barrier Reef and showing you why we are known as Cairns best dive company. Should you require further information about us or anything to do with diving on the Great Barrier Reef please contact us. Pro Dive Cairns is proud to have recently been accredited with the Advance Ecotourism Certification from Ecotourism Australia for their training courses and Great Barrier Reef liveaboard dive trips. This is in recognition of the environmental initiatives implemented to ensure the sustainability of Pro Dive’s operation and to contribute to the conservation of the Great Barrier Reef World Heritage Area. As part of their reef experience Pro Dive ensures visitors have the opportunity to learn about and appreciate the spectacular marine environment. Leading Cairns dive operator, Pro Dive Cairns has received the prestigious Outstanding Business Award (Dive Centre/Resort) at the 2008 PADI Asia Pacific Region Member Awards announced in Singapore recently (18/4/08). This highly contested award from internationally renowned Dive Agency “PADI” recognizes outstanding business performance, initiatives and achievements across all areas of business operation. “Achieving this award in our 25th year of operation is a significant milestone and recognition of our team’s commitment to safety, quality and professionalism,” said Pro Dive Cairns Managing Director, Rod Punshon. It’s been a busy start to the company’s 25th year having also been accredited with Ecotourism Certification from Ecotourism Australia in recognition of environmental initiatives and sustainability, as well as being awarded a Project AWARE Go ECO Operator, PADI’s own eco program. Pro Dive’s commitment to the ongoing conservation of the Great Barrier Reef has received recognition recently from internationally renowned Dive Agency “PADI” as a Project AWARE Go ECO Operator. Project Aware is PADI’s own eco program and is awarded to operators who are dedicated to protecting our marine environment through responsible business practices and to providing visitors with dive experiences that enhance visitor awareness of our local aquatic environment. Click Here to visit our Pro Dive Cairns website.